Italian Chex Mix is make ahead crunchy, salty, savory perfection! 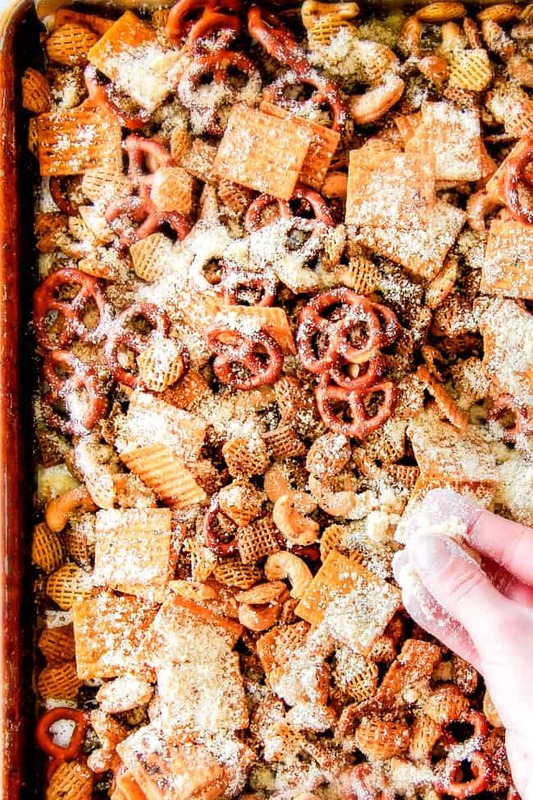 This Chex Mix recipe is bursting with Italian flavor in each cashew, pretzel, chex bite! It is make ahead friendly and keeps fantastically so you don’t have to stress about last minute snacks or appetizers! Also, this Italian Chex Mix is totally customizable – you can pretty much use whatever you have on hand! 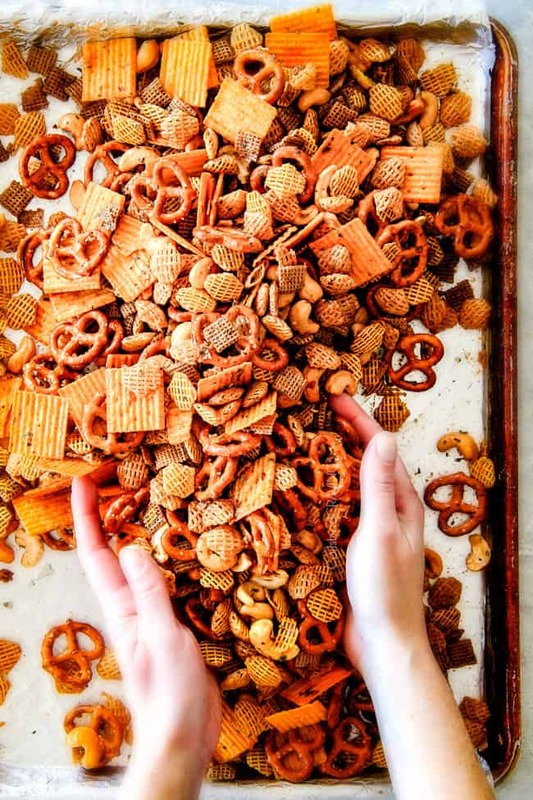 This Chex Mix will become your new, easy go-to party snack that everyone will beg you to make! This Chex Mix is worlds better than the recipes that come printed on the back of Chex boxes. Instead, it’s a compilation of some of my favorite snacks and cereals (Crispix and Wheat Chex are seriously all I buy) in one delightfully fulfilling, texture and flavor packed handful. Each component is delectable all on its own, and together, smothered in Herb Butter Sauce, they are rave-worthy addictive. What I especially love about this Italian Chex Mix is that you can make it ahead of time and it tastes even better the next day, and keeps great for up to a week! That means no stressing about about what to bring or bustling around the kitchen for a last minute snack or appetizer. Also, you are using mostly partial bags of ingredients – pretzels, cereal, etc. so you have everything on hand to make this chex mix again – to be raved about by everyone again and again. But just be warned, you might need to hide this Chex Mix from yourself if you make it in advance because it’s undeniable crunchy deliciousness will call to you, nay, scream to you from whatever dark corner you have hid it to save for later. Good luck. Gifts- just add to a cute bag with a bow! Where Did Chex Mix Come From? Chex Mix might be the most famous and enduring party mix, but Chex cereal actually did not come up with the unique idea. Rather, Chex Mix capitalized on the already popular concept of “TV mixes” using cereal in the fifties by placing an ad in Life Magazine. The ad introduced “Chex Mix” to the world with a recipe including Wheat and Rice Chex in 1952. Corn Chex was later added to the party mix in 1958. In 1985, pre-packaged Chex Mix began to be commercially sold. They have evolved from just traditional flavor to many different flavorings from Cheddar to Hot’n Spicy, Turtle Mix, Sweet’n Salty Snack, Honey Nut, Jalapeno Cheddar, Sour Cream and Onion and more. Chex Mix contains different assortment of either wheat, rice and/or corn chex, nuts, chips, pretzels and crackers. The salty, crunchy combination is intoxicating in whatever flavor combination – but my favorite – this Italian Homemade Chex Mix! What Goes in Chex Party Mix? Now, I have to explain the butterscotch chips addition that might sound a little crazy. The Chex Party Mix is incredible without them, but I personally love the buttery sweetness juxtaposed with the saltiness. I got the idea from a Cajun trail mix I like that also boasts butterscotch chips. They are my favorite part. So take it or leave it, or try adding some chips and see if you like the salty mix gone sweet and salty. I think you will. Does Chex Mix have wheat? This Chex Mix recipe as written does contain wheat due to the wheat chex, pretzels and cheez-itz BUT seven out of eight of the Chex cereals are gluten free! This means you can swap the Wheat Chex and Crispix for gluten free Chex and only use gluten-free add-ins such as gluten free Crunchmaster multi-grain crackers, peanuts, etc. What spices are in Chex Mix? How long does it take to make Chex Mix? STEP 1: Drizzle this all over your Party Mix and toss to evenly coat. STEP 2: Bake for an hour and 15 minutes, stirring every 15 minutes to make sure the mixture evenly cooks. STEP 3: Next, all that’s left is to sprinkle every last inch of Italian Party Mix with Parmesan cheese and toss to coat. But then, really all that’s left is to eat…. And eat. And eat. And sit back and enjoy the buttery, Italian herb, Parmesan coated Party Mix. It salty, crunchiness might just be enough to make your loved ones care less about the outcome of the Big Game and more about who get’s the last fulfilling morsel. Many readers have asked if you can microwave Chex Mix. Technically yes – but SHOULD you? I do not recommend making party mix in the microwave because it is very easy to burn and it it won’t come out as crunchy. Cooking Chex Mix for longer in the oven allows the mix to dry out and become nice and crisp and for the butter to slightly caramelize rewarding you with nutty undertones. Combine all of your Chex Mix ingredients in a large microwave safe bowl (except Parmesan) and and drizzle with butter. Stir until evenly coated. Cook on high for 6 minutes, stirring every two minutes. Remove from the microwave and spread onto a baking sheet. Sprinkle with 1/2 cup Parmesan cheese. Toss until evenly coated and spread out evenly on a baking sheet. Let Party Mix cool completely (cereal will crisp as it cools). How do I Store Chex Party Mix? Store Chex Mix in an airtight container for up to three days then refrigerate if desired. 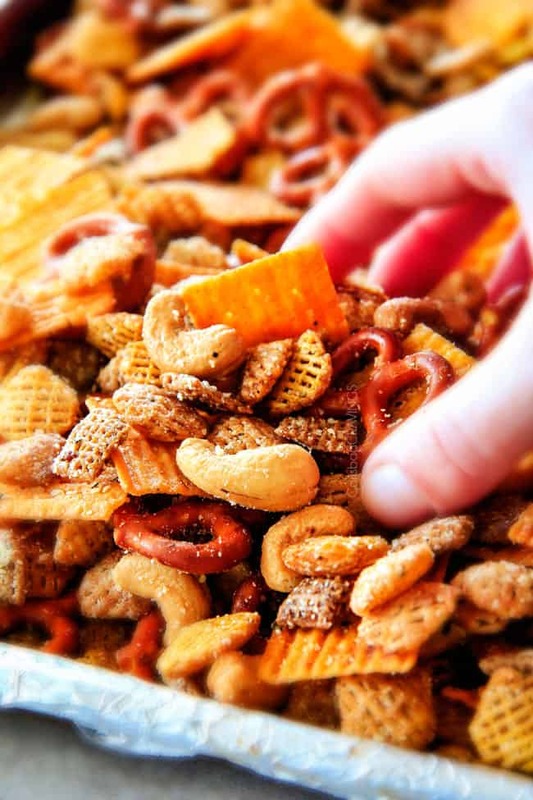 Make sure you squeeze out excess air if storing in a bag to keep the party mix extra fresh. You don’t need to worry about refrigerating your Chex Mix immediately because Parmesan has an extremely low moisture content and does not have to be refrigerated right away. How long is Homemade Chex Mix good for? Your Chex Mix will keep for one week as long as you reseal it each time in an airtight container. Can Chex Party Mix be frozen? 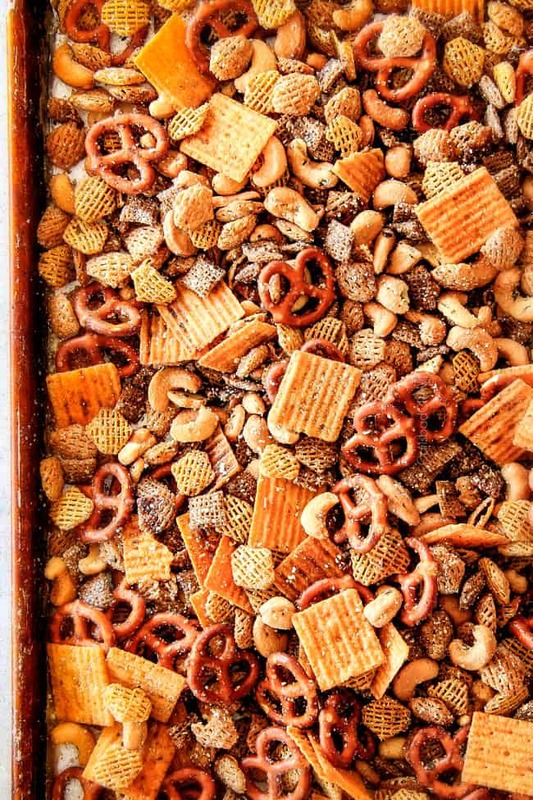 Yes, you can successfully freeze Chex Mix without losing the crunch! To freeze, transfer cooled party mix to freezer friendly bags, squeeze out excess air to prevent freezer burn, label and freeze for up to 6 months. 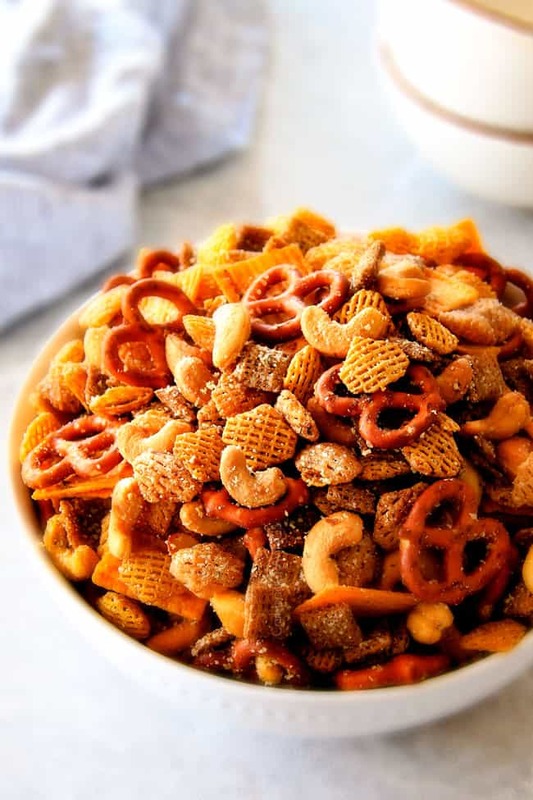 When ready to eat, let Chex Party Mix thaw at room temperature. Make sure you let the Chex Mix cool completely before storing, otherwise it will add condensation to the bag and will not stay dry and crunchy. Swap the add-ins for your favs in equal quantities, but try and swap for equal flavor/crunch. For example, swap the Cheez-It Grooves for cheese goldfish. You can make Chex Mix gluten free or nut free if needed by customizing the ingredients. If you want to switch it up and be a little more adventurous, you could add M&M’s and other sweet ingredients in addition to the butterscotch chips or in place of them. Now its time to paaaaaaaartay! And when I say party, I of course, mean eat LOTS of Chex Party Mix! Want to try this Chex Mix Recipe? Pin it to your APPETIZER or SNACK Board to SAVE for later! 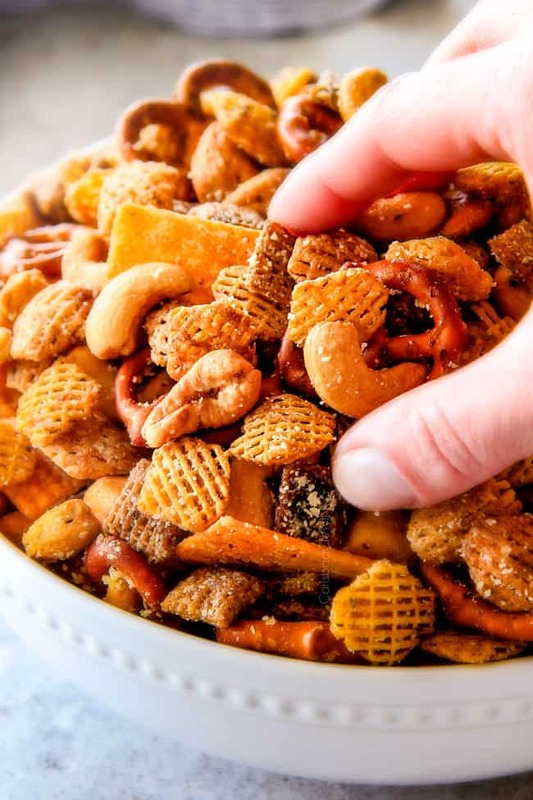 Make ahead crunchy, salty, savory Italian Parmesan Chex Party Mix bursting with Italian flavor in each cashew, pretzel, chex bite! This will become your new, easy go-to party snack that everyone will beg you to make! Preheat oven to 250 degrees F. Line a baking sheet with foil and lightly spray with nonstick cooking spray. Add all Party Mix ingredients to baking pan. 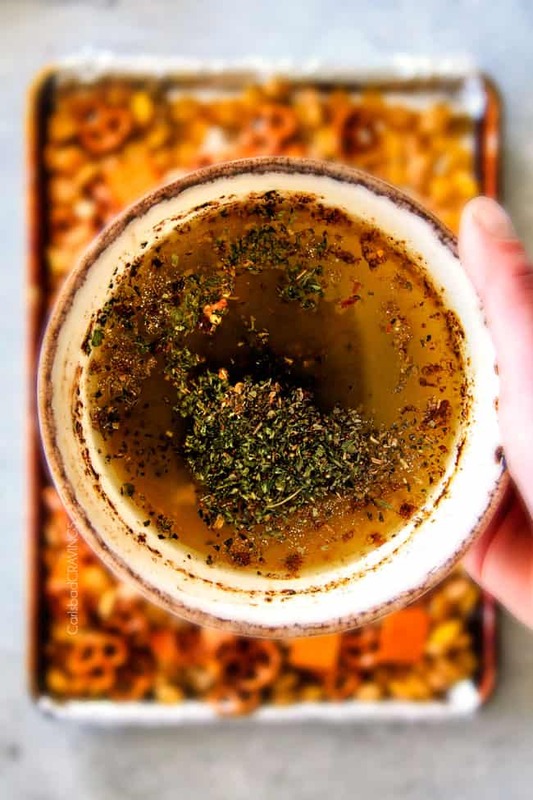 In a medium bowl, whisk together all of the Herb Butter Sauce ingredients then evenly pour over Party Mix. Toss until Party Mix is evenly coated. Spread mix out into an even layer. Bake at 250 degrees F for 1 hour and 15 minutes, stirring every 15 minutes. Remove from oven and sprinkle with 1/2 cup Parmesan cheese. Toss until evenly coated. Let Party Mix cool completely (cereal will crisp as it cools). Toss with butterscotch chips if desired (you can sample some mix with the butterscotch chips to see if you want to add them to the whole thing). I love making chex mix for parties – so easy and everyone loves it. I know this will be a new favorite! Thanks Jen! You are so welcome Holly, I am excited for you to try this version! enjoy! 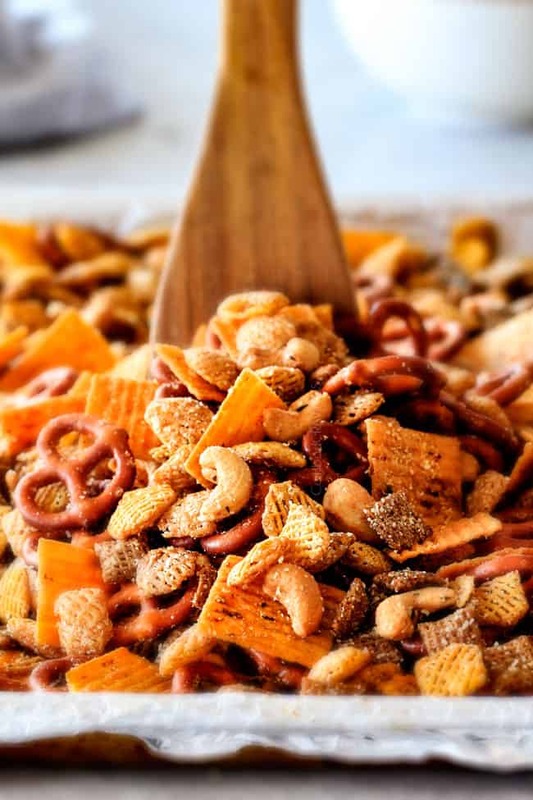 I have never actually made a chex mix before but I am definitely making this one this weekend! Thanks Jen, I know my boyfriend will love it! I am excited for you to try your first chex mix Ginger! I think you both won’t be able to stop munching it! How long will this keep at room temp. in a sealed container? Hi Phyllis, typically Parmesan doesn’t have to be refrigerated at all due to its low moisture content, but just to be safe, I would refrigerate the mix after 3 days. I made this as a Christmas weekend snack and it’s delicious. Like the cashews instead of peanuts. Nice alternative to the traditional version. Thanks Rachel, I’m happy you enjoyed it! This is the best Chex mix I have ever had! I love the savory taste!! YAY! Thank you so much Colleen!